What do you feel about infographics? For me, they’re fabulous! When I googled “infographics creator” last night, I found Piktochart on top of the search results. I gave it a try and here’s my first infographic! 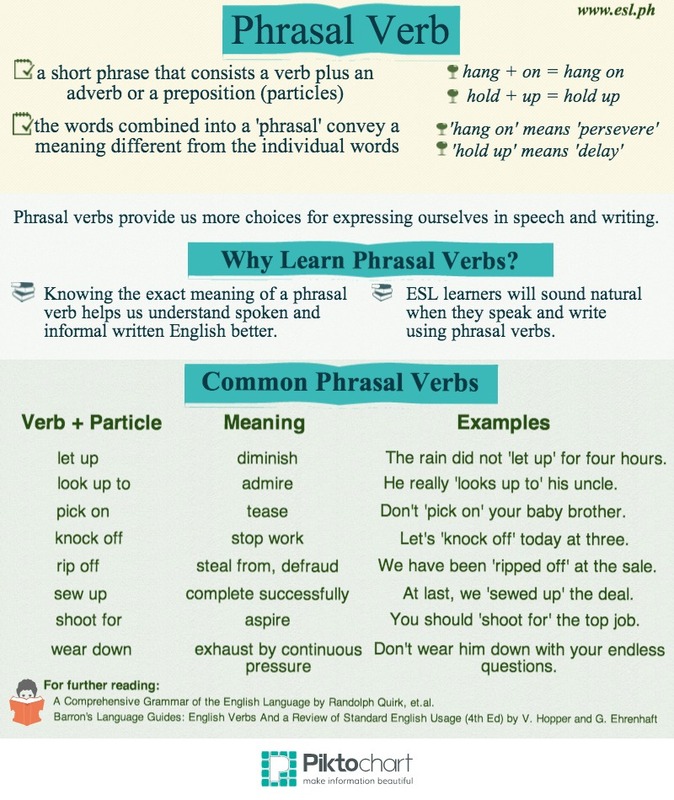 It’s about Phrasals or Phrasal verbs. You can’t switch off the Piktochart’s watermark. You’ll have fewer themes to choose from. The image quality of downloads isn’t as stellar as what Pro users avail. A pdf copy isn’t downloadable. The beginner’s Pro Account costs $29 a month. I’m not sure I’m ready to make such an investment yet. With my current skill level, I could use a lot of practice. But I think it’s a fun way to teach English online. Infographics appeal on visual ESL learners. I hope to master infographics designing so I could use it on our website: www.esl.ph. Feel free to suggest a topic in English that you want me to cover. I’d do my best to capture the essentials in a single image, just like the sample above. I’ll wait for your suggestions! Ciao!